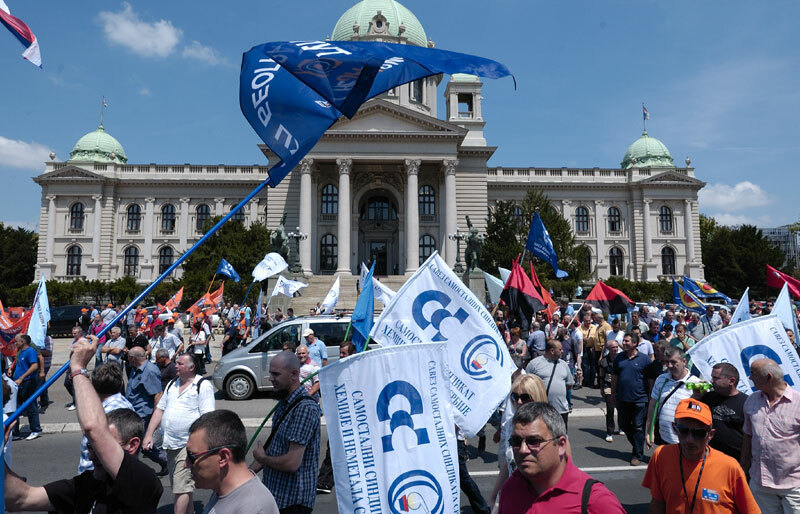 ← Neoliberal assault on working class rights in Serbia: Can the trade unions lead the struggle? The laws have been passed and the cards have been dealt: the new reform of the labour and pension laws which were so hastily proposed to parliament this January, have finally been adopted[i]. These “reforms” legitimize precarious work from the cradle to the grave: they do so, among else, by increasing and flexibilizing work hours, cutting down basic social welfare and extending the pension limit up to 65 years of working life. They will thus make drastic changes to the way all work will be done, paid and secured in the years to come. In Serbia, where the minimum wage is already the lowest in the world, this can have only detrimental effects on the working population. And for leftist groups and trade-unions, this means that the struggle against Serbia’s neoliberal legislative has just reached a whole new level. A Requiem for a Dialogue? First, a short chronology: after a long procedural tripartite debate with the unions and employers, the head of Serbian government, Aleksandar Vučić announces on the 11th July 2014 that the government has just one day to make a decision on adopting the labour law reforms as well as the reforms on laws regulating pension and disability insurance. Almost at the same time, Serbia’s Finance Minister, Lazar Krstić, resigns from his post, saying that “Premier Vučić has a tender heart”, meaning he didn’t want to go for full austerity measures such as the ones Krstić himself proposed – lowering pensions by 20% and public sector wages by 15%, making a drastic cut into the public sector itself by laying off 160 000 employees and ultimately raising the price of electricity by 30% due to damages done by the recent floods. By contrasting these “proper” austerity measures proposed by Krstić to the ones made by the “soft-hearted” Premier – or more accurately, the “Serbian Thatcher”, as some call him – the reforms of the labour and pension legislation are given legitimacy despite the fact that such reforms will make wage, subsidies, unions and social welfare a thing of the past. Krstić thus became the second Minister, after Radulović, to have been sacrificed in the name of the new laws. Of course, no sacrificial ministers can guarantee that the austerity measures they proposed will not be adopted. Such is the case today as well: after his resignation, Krstić went on to join the Serbian Fiscal Committee which recently announced that around 100 000 public sector working places will be cut down in the following years. How this will “save” an economy where 790.501 people are already unemployed[ii] and where aggregate demand is already weak due to low wages and government spending is not clear. Thus the liberal government only changes its players, but not the rules of the game. The rotation of political players was not only accompanied by an affirmation of the laws, but also by an outburst of anti-unionist ideology in the mainstream media[iii] with the obligatory support from all major parties, across the whole political spectrum. As Ivica Dačić, leader of the so-called Socialist Party of Serbia (SPS) said, the new law must be introduced even if he “set himself on fire in the streets”. Unfortunately, Ivica Dačić did not set himself on fire. But his words express exactly what the government is pushing for: an all-or-nothing approach, regardless of party affiliation[iv]. However, unlike the governments’ changing players, the two largest representative unions, the United Branch Union “Independence” (Ujedinjeni Granski Sindikat “Nezavisnost”) and the Confederation of Autonomous Unions of Serbia (Savez Samostalnih Sindikata Srbije) have been been consistent in their stance against the law ever since it was announced this past winter. Upon realizing that the make-shift law is being adopted without their approval, these two unions decided to immediately mobilize all available work force and supportive population to protest on that same day in front of the government. Alas, to no avail. The government concluded that the laws will be adopted officially on 17th July and will enter into force on 29th of July. Thus, on the 17th, both unions responded by deciding on a general strike beginning on that very date and in front of the government itself. After arriving in Belgrade, an estimated mass of around 10,000 workers,[v] leftists, and ordinary citizens gathered in front of the National Assembly. Given the size of the rally – despite the country’s great deindustrialization in recent decades due to neoliberal policies – one could find workers of nearly every town and every branch from metal workers, gunsmiths, miners, but also white collar workers and leftist organizations. This is an important event as it marks the end of social dialogue and sheds new political light on the antagonisms which structure the relations of production. Thus, upon gathering and encircling the Assembly which rejected every one of their proposals, the 10 000 protesters held a minute of silence, “for the death of social dialogue“. Perhaps not entirely a coincidence, the same labour reforms have been carried out in Croatia at the same time as well. This race to attract foreign direct investments that is being carried in the whole region thus shows itself as a thorough “race to the bottom,” which only results in cutting basic social welfare at home. Thus, by adopting the laws after a failed public dialogue, both states have showed that the tripartite structure – unions, employers and the state – once needed to make these laws, is in fact considered as a historical contingency left over from the welfare state, as just another historical fallout, and nothing more. Whether or not the unions should mourn the “death” of this contingent dialogue is a question that remains to be answered. As can be seen, the Thursday protests were not an end, but a beginning, albeit a complicated one. Ljubisav Orbović, head of the Alliance of Independent Unions of Serbia, states that the first steps to organize a referendum on the withdrawal of the law, are under way and will be carried out in the following months. However, just few days after adopting the new law in its „reformed“ shape, the Serbian Minister of Commerce, Rasim Ljajić, gave a statement saying that yet another new labour law (sic!) would be adopted this winter – because allegedly the current one that was adopted a few days ago is „not European enough“ and not the „right one“. For this reason, the unions have postponed the general strike for autumn when the referendum will have taken place, and when the remaining crucial public sector workforce will be back from their holidays (this is important as the government initiated the reforms both times intentionally during the holidays). Expressing their support were also the Pan-European Regional Council and the International Trade Union Confederation whose representatives have visited and will aid the two largest Serbian unions, the Confederation of Autonomous Unions of Serbia and the United Branch Union “Independence“. Meanwhile, further complicating things, Aleksandar Vulin openly announced another law, this time,one regulating unions: among else, it will enable the ruling minister (namely, himself) to directly decide which unions he will enter negotiations with, thus circumscribing the Committee for the determination of representativeness. Given the fact that this and other new laws are yet to be considered by the Parliament – such as that of privatization to be voted on in August this year, which will restructure 158 state-owned enterprises and public sector workers – there is much more work left to be done by the opposing groups and unions. A new player in town? But before any resolution takes place, a contradiction that is at heart of the matter must be acknowledged: liberal policy makers cannot simply do away with the unions they seek to undermine. Although the unions are completely sidelined from any political life by the ruling parties, they still represent a significant pool of voters and are thus recognized by the parties as a potentially useful tool for a proper political victory. This of course has left many contradictions within the union members as well since it is not uncommon to see state unions support privatizations and denounce cooperation with private sector workers[vi]. This contradiction isn’t going to resolve itself: it must be resolved either by completely pacifying the unions which would end their struggle for good or by a rejection of the law and the government procedure which brought it, and so to speak, by rejecting the rules of the game, and not just the players. A “third way” with a peaceful coexistence of unions in their present shape and practice on the one hand, and a new labour law with its twin-laws regulating pension, disability and privatizations on the other, is an unlikely solution for both sides. However, not all is lost with these “reforms”. The crisis is a morbid interregnum, says a famous Gramscian quote – where „the old is dying and the new cannot be born“. But for Serbia, and the once socialist Balkan states as well, perhaps the opposite can be said: that new is dying, and the old is struggling to be born again. The new liberalism in the Balkans could only have been established once its socialist predecessors were long dead and ideologically forgotten and excluded. But it’s the socialist movements that have been born or revived now throughout the region. As was the case in Slovenia, the Belgrade protests also served as a first impulse for the public emergence of a new player: The Left Summit of Serbia (Levi Samit Srbije), a platform gathering most left-wing groups and workers alike. Although not an official party, it is the first organizational structure that has managed to develop itself in the last few years as a space for political articulation and cooperation comprising major leftist groups, trade unions and public sector workers. During the protest, those groups have appeared under one banner for the first time. Given the fact that this converges coincides with the recent parliamentary victories of the Slovenian Initiative for Democratic Socialism – a young left-wing party similarly formed during the protests – one could say that the liberal political turmoil in the Balkans has brought new players with an alternative to the crisis into view. This however, does not mean that one should slide into a comfortable political optimism. If we ask, following Mirowski, what happened to liberalism after the crisis, we would get the same answer everywhere: „Nothing!“. It has remained intact. The same goes for Serbia due to the imbalance of political forces at play. But no political optimism or pessimism can negate the fact that the new liberalism was made possible by a social process and by the members of the very society which it negates. In Serbia it must have relied especially both on the unions and workers of Kolubara on the 5th October, which is a fact too often forgotten. And the social process that brought it forth is the same process which can bring it down. What this process will achieve and how, remains to be seen, perhaps as early as autumn this year. The open violence of the Balkan labour r ..
What Europe are we sacrificed for? TTIP .. Struggling Against Serbia’s New Labour ..
[ii] According to the National Employment Service of Serbia, data from March 2014: http://www.nsz.gov.rs/live/digitalAssets/1/1862_bilten_nsz_03_2014.pdf. This constitutes an unemployment rate of roughly 21.6%, National Statistical Service, http://webrzs.stat.gov.rs/WebSite/Public/PageView.aspx?pKey=26.However, the last data is from February 2014, not March 2014.